Watch Crizal videos in the Crizal Media Library. The sun is all around us. Give your eyes 360° protection! Introducing Crizal Sun Shield. I'm sure you have heard of Crizal's anti reflection treatment, well now you can get the same benefit of the AR treatment with your sun wear. 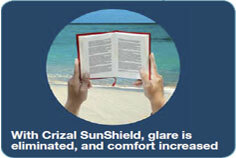 Crizal Sunshield is a UV protecting lens with backside glare protection. Did you know ordinary sunglasses do not provide total UV protection? They offer protection from UV light entering on the front side of your lenses; however, they don't protect your eyes from UV light reflecting off the backside of the lens. 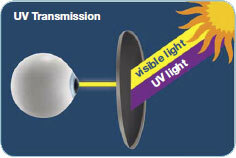 This is the first lens to eliminate glare and also block backside UV that can be harmful to your eyes. 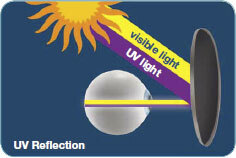 Provides UV protection by eliminating UV reflections on the backside of the lens. Enhanced long term Cleanability with the addition of anti-static properties. of Essilor's exclusive SR Booster™ Layer. 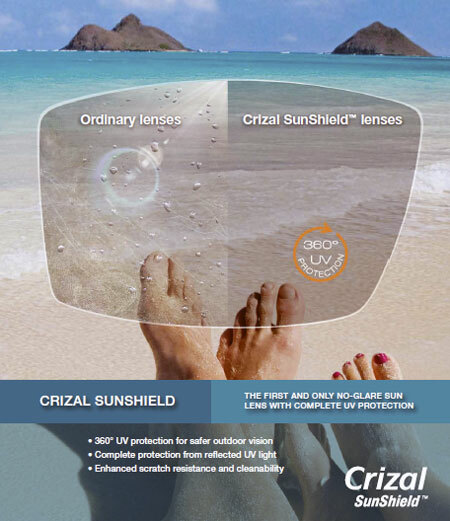 Patients typically treat sunwear more harshly than their primary lenses, so Crizal SunShield has made major improvements in scratch resistance and Cleanability with the additions of the SR Booster Layer and anti-static technology. Now, Crizal SunShield has double the backside scratch resistance of the previous generation, providing even more protection for the lenses. Plus, the lenses now repel dust and dirt on the backside, which allow lenses to stay cleaner longer and require less cleaning. Finally, Crizal SunShield continues to provide superior Cleanability on both sides of the lens with an industry leading 116° contact angle courtesy of Essilor's exclusive High Surface Density™ (HSD) Process. The end result - Crizal SunShield is the most scratch-resistant, smudge-resistant, easiest to clean sun lens ever. Crizal SunShield UV is the first and only No-Glare made for sunglasses, using a technology that reduces backside UV reflections, therefore providing you with healthier long-lasting vision. 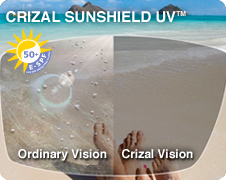 In fact, Crizal SunShield UV offers the most complete protection; with an E-SPF of 50+. This means that your eyes are at least 50 times better protected from dangerous UV light than wearing no protection. Most sunglasses that claims 100% UVA/UVB protection only blocks UV light from being transmitted through the front of the lens. 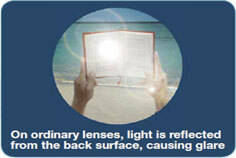 It does nothing to address the dangerous UV light that is reflected off the backside of the lens into the eyes. damaging UV reflections that bounce right back into your eye. comfortable than with ordinary sunwear.